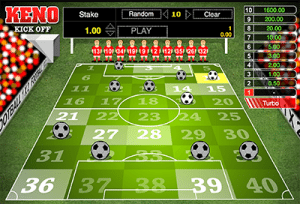 1X2 Gaming’s Keno Kick Off is a classic football themed keno game – simple and tame, but with the potential for some major payouts. Set within a soccer field, with supporters cheering you, you get to select your numbers (just like in any regular keno game) but will have players and footballs reveal if the winning numbers match your chosen numbers. Once you have opened the game in your Web browser, you will be directed to adjust your stake and then can select however many numbers you wish, up to a maximum of 10. Numbers 1 – 40 are displayed on the soccer pitch – simply click on them to choose them (and again to remove your selection). You can also opt to select your numbers at random via the ‘random’ button at the top of the game. Use the arrows adjacent to the ‘random’ button to adjust how many random selections you want. To the side of the game you will notice the pay table – the pay table changes based on how many numbers you select. If you only select one number with a total stake of $1.00, the return for hitting that one number is x 3.50. If you select two numbers with a total stake of $1.00, the return for hitting one number is x 1.00 and the return for hitting both numbers is x 9.50. Play around with the different number combinations to confirm the pay table your prefer. Regardless of your total stake, the pay out ratio will always remain the same if you keep the same amount of numbers selected. For example, if you have selected three numbers at a total stake of $2.00, the return for hitting one numbers is x 1.00 ($2.00), the return for hitting two numbers is x 2 ($4.00) and the return for hitting all three numbers is x 18 ($36.00). Once you are happy with your chosen selections, hit the ‘play’ button. Ten players will then run out on to the field (one at at time) and will reveal random numbers on their shirts. Footballs will then drop onto the corresponding numbers on the field. The aim is to match as many of your chosen numbers with the numbers on the players’ shirts. You have the option to play in ‘turbo’ mode which will speed up the round (players will run on to the filed much faster). The ‘turbo’ button is located below the pay table. Note that the maximum pay out is $10,000 (a total stake of $20 is placed and all 10 of your numbers are hit – this result is capped at a payout of $10,000, rather than what would be the actual ratio of $20 x 1600.00). Australians aged 18 years and older can legally play Keno Kick Off for real money at Emu Casino. Emu Casino is licensed and authorised by the Malta Gaming Authority and the Government of Curacao. It is also regulated by the independent player protection and fair gaming testing agency, eCOGRA (the eCommerce Online Gaming Regulation and Assurance body). Sign up for a free account with www.EmuCasino.com and play 1X2 Gaming’s Keno Kick Off game. Designed specifically with Australians in mind, Emu Casino hosts games from several highly regarded software designers, such as 1X2 Gaming, Microgaming, BetSoft, Net Entertainment, Multislot Gaming, Rabcat Gaming, Leander Games, Genesis Gaming, QuickSpin, Push Gaming, Playson Games and Oryx Gaming. Established in 2012, the casino site was relaunched in 2015 with a beautiful and fresh design, now boasting a neat, slick and user friendly interface with more than 800 casino games, including: pokies, blackjack, roulette, scratch cards, baccarat, sic bo, craps, keno, bingo, poker, other table games, virtual sports titles, video poker and plenty more. Emu’s also owns a mobile/tablet gaming platform, with more than 200 of the most popular titles optimised for that platform. Games retain the high quality graphics, visuals and audio. All games, which use the latest browser-based technology and formatting, can be played directly via your Web browsers (also known as instant play), on desktop, laptop, mobile and tablet devices – no installations are required. Play Keno Kick Off at EmuCasino.com for real AUD money.